The atmosphere appears to be finally drying out here on the east coast of Australia. Viewing from near home on the 24th of April, DSO’s were noticeably easier to see and make out detail in. The clearest for a very long time. Thought I’d tackle a Monster too. This one’s been taunting me for some time. Teasing through the mushy viewing during the last year. It’s “Eye” staring back in defiance. Here is my shot at Omega Centauri using my 17.5″. So mind numbingly complex in structure. It’s core shows it’s “eye” looking back, which is washed out in long exposure photos. This is Omega’s most outstanding signature feature. Media: Pastels, charcoal and white ink on A4 size black paper. Beautifully recorded view of an enormous collective of stars. 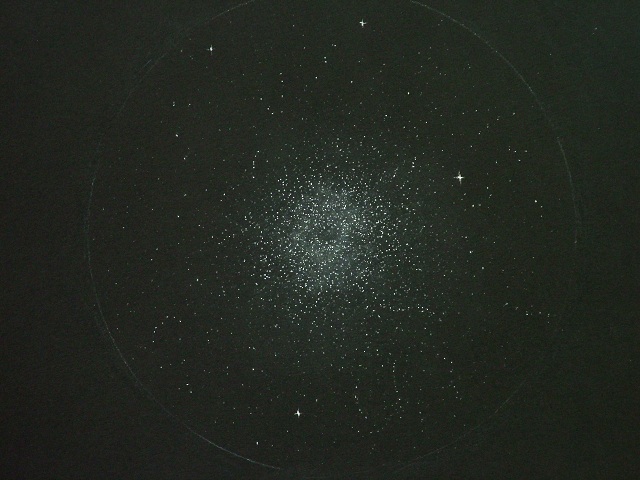 Fantastic sketch – I did not know the “eye” was a feature of Omega Centauri. I will be looking for it now.